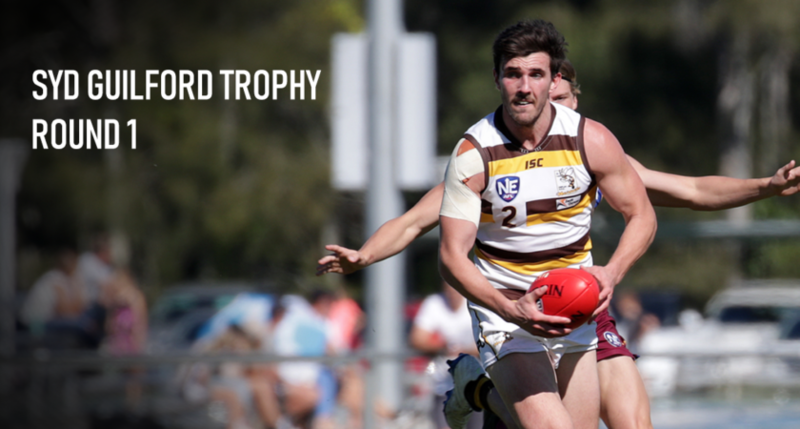 Morningside midfielder Henry Joyce has wasted no time acquainting himself with his new surroundings with his best on ground performance against Labrador enough to earn the maximum ten votes in the Syd Guildford Trophy. Joyce was the only player across the opening round of the QAFL to earn five votes from each coach after producing a masterclass in the Panthers’ 13-point win over the Tigers at Cooke-Murphy Oval. After 88 games for Aspley in the NEAFL from 2014 to 2018, Joyce returned home to Jack Esplen Oval in the summer and has already emerged as one of the best two-way midfielders in the QAFL. Labrador skipper Bryce Retzlaff earned eight votes after booting four goals in the Tigers’ loss as he again imposed himself as a key pillar in the forward 50. Tigers’ midfielder Alex McKay (four votes) and Morningside duo Peter Mollison and Lachlan Russ (both three) also polled well in the contest. Elsewhere, Palm Beach Currumbin spearhead Jack Anthony polled a game-high nine votes in the Lions’ win in their Grand Final rematch with Broadbeach at Salk Oval. Just seven months after winning the Joe Grant Medal as best on ground in the Lions’ Grand Final win over the Cats, Anthony again proved his worth with an eight goal haul in the opening round of the season. Honours were shared between a pair of Surfers Paradise teammates in the Demons’ win over Wilston Grange as Samuel Jewell and Nick Scott both earned a game-high six votes. In total, seven players received more than two votes for their efforts with the aforementioned Surfers Paradise duo followed by fellow Demons Matthew Green (five) and Mitchell Comben (four) and Frazer Eaton, Connor McKenzie and Thomas Smart who all polled three. The weekend’s closest game wasn’t reflected in the votes as Mt Gravatt dominated the voting in their narrow six-point win over the Western Magpies. Michael Hamill came one vote shy of joining Joyce with the maximum ten votes but led all-comers with nine as mercurial forward Sam Stubbs earned five to coincide with his five majors that helped earn the Vultures the four points. Veteran Frazer Neate (four) and the Aspley-listed Jasper Craven (three) rounded out the Vultures’ quartet while Magpies Liam Dwyer also earned three votes in his hard earned battle in the ruck with Andrew Smith (two).